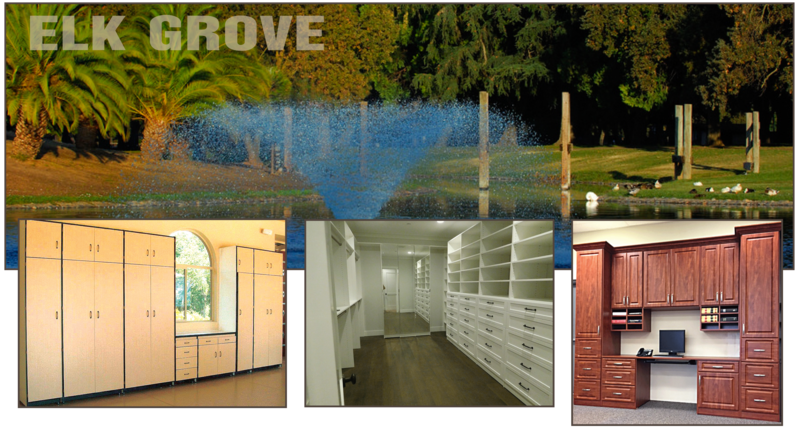 Elk Grove, California - Alpine Cabinet Company "
Customized garage cabinets, custom closets, home offices, and entertainment centers, Alpine Cabinet Company will transform your space with the style you deserve and the storage you want. Alpine’s cabinetry provides the best storage and organization solutions in Elk Grove since 1984. We walk you through the process from free in-home estimates and design options to professional installation. All of our custom cabinets are precisely engineered in our 25,000 square foot manufacturing plant to deliver the best cabinets in the industry. As a locally owned business, Alpine provides exceptional personal and professional service. Our garage cabinets are designed for strength with custom shelf brackets and stability with floor standing leg levelers. Custom closets transform your space while providing much needed storage and organization. Home office options range from a beautifully appointed home office to a small office space and everything in between. Our entertainment centers are designed with discrete storage for your electronics and custom display space to accentuate your home decor. Whatever your cabinetry needs, Alpine delivers the best cabinet options in Elk Grove. Contact us and we’ll help you fulfill your storage and organizational requirements. Also serving communities around Elk Grove such as Laguna, Sheldon, Wilton, and Franklin.